Last week I wrote about an intriguing perfume vending machine that was up for auction on eBay. With "nips" or samples of the perfumes Evening in Paris, Silhouette, and Silent Night — all for the price of a quarter — the perfume vending machine was a tantalizing artifact telling us about perfume's status on the American market in the 30s. In a Twitter conversation I had with Michelle Krell Kydd of GlassPetalSmoke, I told her I found the idea of a perfume vending machine so charming because it combined luxury with a dimestore aesthetic. I was interested, I said, in the history of perfume vials and samples, and she said it sounded like a "future blog post brewing." Well, you were right, MKK! I did a little online research, and the following is what I found. I will update it as I find out more. First off, eBay auctions can be vast repositories of information. 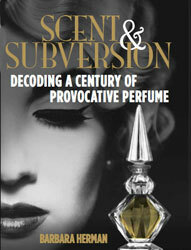 Two items up for auction now, in particular, told me a lot about perfume and marketing via nips. Both auctions, for hard plastic cases housing nips of various perfumes, were actually promotional gifts given out by companies that had nothing to do with beauty or luxury. In one case, the company name printed on the back of the perfume gift reads "Flint Telephone Employees Credit Union"(!) How, er, uh...glamorous! I guess if you worked for Flint Telephone back in the day, you might need a little Shocking by Schiaparelli or Indiscret by Lucien Lelong to throw a some fantasy into your life! In another auction, a similar promotional perfume gift also included 2 1/2 inch (plastic?) tubes of Dana's Ambush and Tabu perfumes housed in paper "purse packs." They resemble the tubes that Alberto VO5 hot oil treatment comes in now. "What the person has is called 'Nips' which was a patented name for a method of perfume sampling from the 1930-1950s. The tubes were made of something called plastene or sometimes glass. The ends were broken off and the perfume inside was then one use per tube. Many perfumers used them just for their own scents and they were also put up in cardboard tubes in thousands of different applications from Chevy dealers to motels to airlines, all who used this form of perfume sample. They came color-coded on the tips so if you used one that was pink it was Shocking by Schiaparelli...I have a set of Nips as suit card indicators in bakelite for playing bridge that are just quite unusual." Say what?! "A set of Nips as suit card indicators in bakelite for playing bridge"?! Unusual indeed. I need to see a picture of this! A lot is written by marketers about the so-called "democratization of luxury," but to me these perfume samples in unusual settings (like tiny representations of poet Wallace Stevens' "a jar in Tennessee") exemplify it. Instead of Alexander McQueen selling poorly-made skirts for Target, how about Serge Lutens' latest fragrance sold in nips at Walmart (or Walgreen's or CVS) for a dollar a pop? That is the "democratisation de luxe" to me! They hardly even give out sample vials anymore. I receive them when the salesperson does a cold assessment of me based on what I am wearing (or what purse I am carrying) and then deigns to find me worthy of a sample. This happened recently at the fancy perfume section at Nordstrom's in San Francisco; I got a sample of Fracas. And just a few weeks ago, a generous Kilian rep at Saks in Costa Mesa gifted me with samples from his entire line — perhaps because I knew what oud was? I guess it's not affordable to hand out samples anymore, but how many nascent perfume-lovers may never be born because they don't actually have the juice with them to try on at home? In any case, I'm not sure when the Nips transitioned into those glass vials, but I'll let you know when I find out! LOVE the idea of luxe fragrances delivered as perfume Nips at Walmart. Sounds like a marketing plan. Nips curiously resemble ampoules though it looks like there are two breakable ends. I wonder if that was the inspiration for the Nip design. Fascinating post. Look forward to learning more! Moongrrl, I would too! And the delivery system would add to the perfume experience...and Michelle, you've got me intrigued about ampoules. The word alone is evocative! My mother gave me a box of these perfume nips a couple of years ago. She bought them in the 70s when she went to America on vacation. For the longest time, I was wondering what they were called and why they don't seem to exist anymore. I'm glad I found this post! Hey Japanesebystander, thanks for stopping by. I left a comment on your blog; I'm curious about what perfumes are in the nips, and, come to think of it, whether or not there's an incongruous advertisement on the back. I have a box of these (including the instruction sheet you posted above). What would something like this be worth? Do you have links to the eBay auctions you referenced? Hi Liz, I see these going anywhere from 20 - 50 dollars. I think more if they're vintages people still recognize and consider classics (ex. Shocking by Schiaparelli). What perfumes do you have? It's a little case with tubes in it. Each tube contains 10 nips. They are: Spicy Bouquet, Modern Blend, Fruity Blend, Single Floral, Oriental Blend, Forest Blend, Floral Bouquet. A friend gave this to my daughter to play with because she's into making her own perfumes. She said it has been her grandmother's, but she never used it and passed it down to my friend. There is no advertising or markings on the box - it's a gold-cover box with a gold print and a black bottom. When we took the kit out, there was a card in the bottom that said "Happy Birthday, Virginia, from Vega: 3/6/59." The only other thing is the instruction sheet you posted above. I didn't want to allow my daughter to play with this if it had collector's value to someone. If we're only talking $20-50, I will probably just let her have it (not worth selling on eBay for that amount). However, if you do think this is more valuable for some reason, please let me know and I can save it for whomever wants it. Thanks! If the'yre worth more than $50 to you, Liz, I'd keep them. I've never seen them fetching for more than that on eBay. Sounds like a wonderful keepsake. I was enthralled with perfume nips as a little girl in the early 50's and remember them so well! I did not know they were sold in vending machines though! Mine were supplied in small rectangular boxes containing perhaps 20 nips. Thanks for the memories! Theyre pretty cool, Carole. I keep meaning to get some and crack one open! I have a pack of 4 perfume nips from the 1950's... is anyone interested in buying something like this? They were given to me as a tip when I worked at a Bob Evans.. Have had them for almost 40 years.. Just wondering??>? What's Bob Evans, Deb? And what perfumes are in the nips? I used to receive sets of nips now and then as gifts when I was a young teen in the 60s. I remember that they smelled so exotic and wonderful, if I remember right, they were always French perfumes. Lately I've been playing around with a little natural perfumery myself, and I was remembering a set of nips I got once that was not samples of named perfumes, but rather the type of perfume, ie, 'spicy', 'floral', 'fruity', etc. I don't remember any of those at all except for the 'fruity' sample, and it has really stuck in my memory. These were not cheap drugstore perfumes either I'm pretty sure. The fruity sample was magnificent. The only perfume I'm familiar with that I can compare it to is maybe Mitsouko, but it was fruitier than that. Wonderful. I couldn't remember the name of what these little glass samples with the colored tips were called, so I did a google search just now and came up with your blog entry. It was cool to see a picture of the little nips in their case again! Hello. I have a set of 97 in a gold cardboard box. The nips are in a plastic box with a gold plastic tray for the nips to lay in inside the plastic box which lays inside the cardboard box, plus it has a gold plastic tube with it which I'm assuming is to carry some of the nips for traveling. I think It may have been a set 0f 100 but not sure. I got this from my grandmothers stuff years ago and forgot about them till I got to cleaning to day. Would love to sell them for the right price or just find out what they would be worth.. I can send pictures if anyone is interested. Well i just found this website. I just paid 50 cents at a yard sale for a plastic box with 71 nips in side with the list of perfumes also in side. I love this. I wish I new how old they are. This is the neatest find I have had in a while. Thank you for posting the information. just given a little small set of nips my friend found at a garage sale for .50 cents. She also found a tiny sample size of Chamade and another. But these little nips have just piqued my imagination. Yes, perfume vending machines and exotic perfumes at Target? Double yes. I once bought a box (of 25 I think) at a thrift store. There was no advertising on the plastic box. They were color coded and I dumped them out on the living room floor to line them up and see what fragrences I had. I ran into the bedroom for my notebook, and my son comes in and (not seeing them) stepped on the pile of glass nibs. I think 3 survived. They didn't smell too good in a mix like that!! I've never found another set. OH, I forgot to add, in response you your comment on stingy perfume counter people. Early 1980s. I once went into a Diamonds dept store looking for a lipstick that was similar to a vintage one I had. I was wearing vintage clothing. The clerk was absolutely rude to me, so I went to the next counter that was Estee Lauder. The clerk was an angel, and after spending $400, she gave me samples of whatever she had. The rude clerk at the other counter was practically snarling! Diamonds paid by %, and $400 made a nice commission for the Estee Lauder clerk! As a young girl in the 1940's, I remember sitting around the dining room table with my mother sister and aunts and grandmother sorting nips and packaging them in small red cardboard tubes. My Aunt Mary Prendergast was a partner in the Nips Inc. company based in NYC and hired us to help. They must have been short of help or perhaps this work was always outsourced. Susan! Thanks for sharing this charming story. I may get in touch with you to find out more. Thank you! I didn't know these were called nips. I have 115 sets of nip viles all kinds of perfumes chanel no.5 and alot more contact if interested all for sale. Who made extrait liz de liz paris?